The jade plant (Crassula ovata) is also known as the money plant and is widely believed to bring good fortune. It can also be called the money plant. Jade plants are a very common indoor plant but can also be grown outdoors in frost free environments and can grow up to 10 feet tall. As a house plant the jade plant is low maintenance but is very vulnerable to over watering. Potted jade plants thrive on a well lit windowsill and will grow even if neglected. The main problem with jade plants is root and stem rot caused by over watering. Only water your jade plant when the soil is completely dry on the surface and allow the water to drain out of the pot completely after watering. Do not put a saucer under your potted plant as any pooled water will cause the plant's roots to suffocate and die. Jade plants benefit from a period of little or no watering at all during the winter months. As a basic rule only water a jade plant once every two weeks. If your plant has plump shiny leaves it is receiving enough water. Jade plants with slightly wrinkled leaves can be watered more often. Plants kept in direct sunshine can be watered more often than those grown in light shade. A jade plant that flowers should be watered every 10 days while it is in bloom and then allowed to dry out completely for a month after flowering. 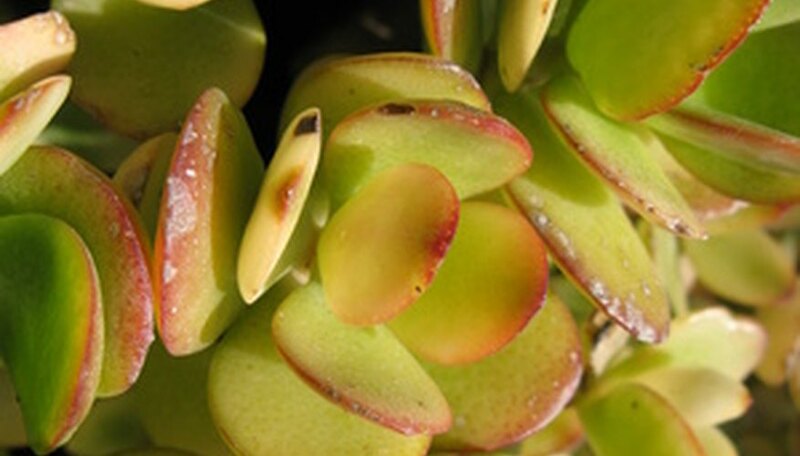 A jade plant that is receiving too much water or has been standing in waterlogged soil will often develop yellow leaves that eventually drop off. Soft branches or stems are a sign of rot and must be removed as soon as they are discovered to prevent the rot from spreading. If you suspect that your plant has received too much water, do not provide any more and place the plant in a warm sunny spot until the soil in its pot has dried out completely. Cut off any soft branches as soon as you find them and check the main trunk for any signs of softness or rotting. A plant with rot on its main trunk may be beyond recovery but can be rescued by removing it from its pot and placing the entire plant in the sun for a week until it has dried out completely. Any parts of the plant that are soft must be removed. If the main stem of a rotting plant continues to die off, then cuttings can be taken from any stems that remain unaffected. Replant a rescued jade plant or any cuttings in as small a pot as possible using compost that is at least 50 percent sand to aid drainage. Make sure that the pot has a large drainage hole. Jade plants can also be grown from individual leaves planted directly into damp sand with their tips facing upwards.